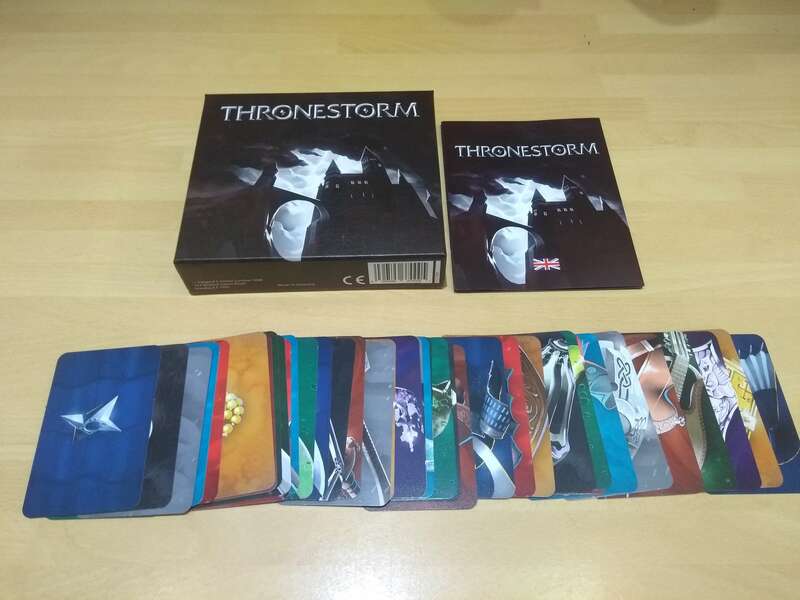 Thronestorm is a compact card game that is simple to learn and play. In it, you must try to create a set of four items — a sword, a shield, a helmet and a trinket — that completely match each other. Sets match by their colored background; general character type when it comes to all of the items in the set; and the colors of the items themselves. There are ten different types of noble houses — so there are plenty of cards to collect. Your inventory can hold one of each type of item, and you also have a realm in front of you that is shared with the other player. This realm starts off as four trinkets in the middle of the table — one on the bottom, two in the middle and one on top. This is a bit hard to describe, but is well conveyed by pictures in the rule book. Once you start grabbing cards that don’t fit into your inventory, you can move them into the realm. You can’t move items around in the realm once they are placed unless you have a card of the same color as the one in the bottom row of the realm facing you. I’ll explain this more when I discuss Thronestorm’s turn structure below. This small box comes with a deck of beautiful cards, each with realistic graphics. 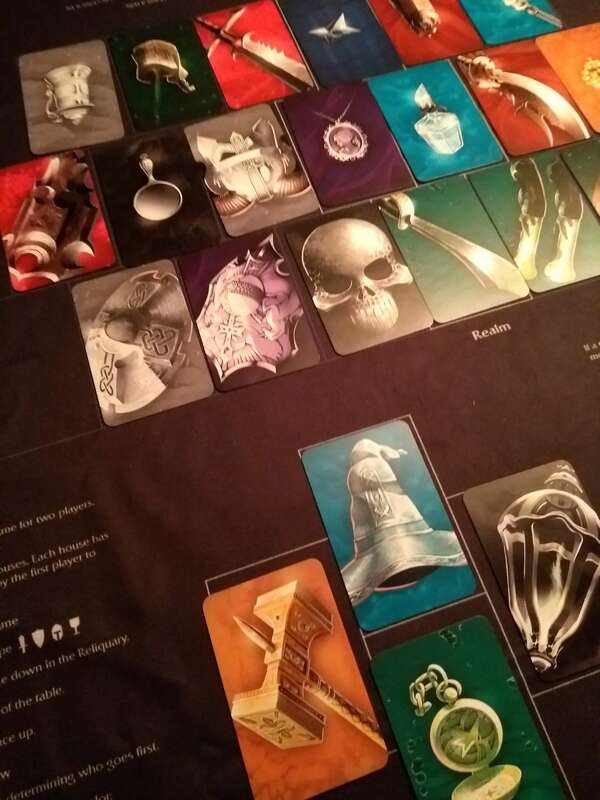 There are forty cards in total, as well as a rulebook in the box. I was able to play Thronestorm on a giant tablecloth meant for expos — which easily showed how to play the game as well as where the different items go. Though this cloth was cool to play on, it of course isn’t needed. You start Thronestorm with nothing in your inventory but four different piles of relics on one side of the table. The top card in each of these piles lies face up next to them. You can select one of them to put in the correct slot in your inventory. The way the item depicted on each card is angled, putting a bunch of them together creates a kind of kit portrait of your character in your inventory. There are also four different trinket cards in the realm in the middle of the table. Once you have some cards in your inventory, you could start grabbing the same type — i.e. taking a helmet from the sidebar when you already have a helmet in your inventory. If you do that, you have to place whichever helmet you don’t want into the realm. You can also play in the realm, as long as you have a card with a color matching the cards closest to you in that realm. You can then shift around the three cards that are in a row connected to whichever card you matched to match to. Three cards must return to the realm in their place, but you can switch out as many of them as you’d like. You may want to do this to move cards from the bottom row of your opponent’s realm, blocking off rows from them. Card placement in the realm follows a pattern: you must place items in the bottom and top row before putting a card in the middle. 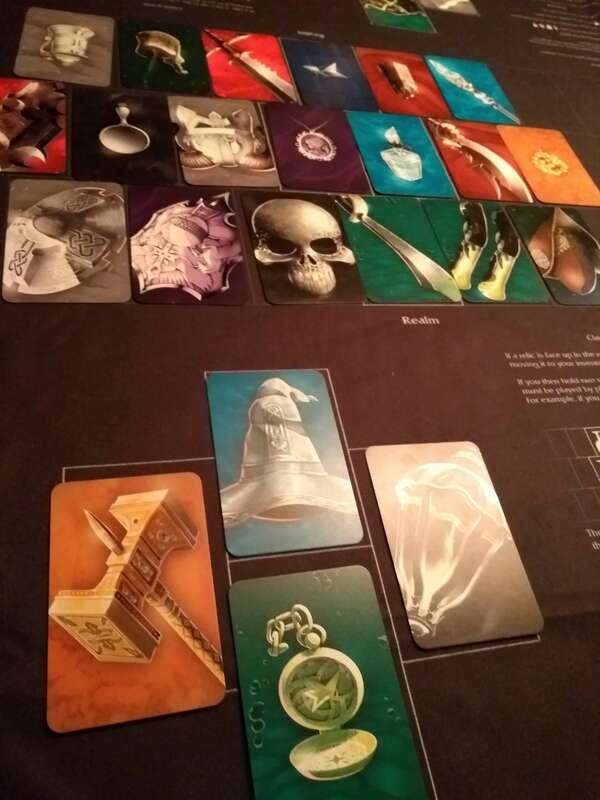 This sometimes forces you to place cards where you may not want them, adding a lot of strategy to the game. I played two versions of Thronestorm: the beginners’ version where you remove two of the classes, plus the full game with those two added back in. Those two sets of cards really make a difference. The gametime, when playing against someone who gets really into the game, increases a bit when you add the classes. 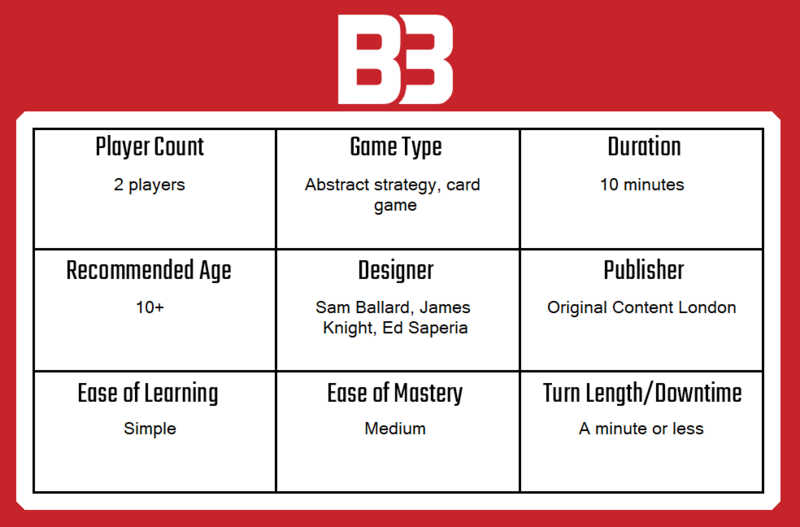 Once you get playing, and after the first round, it’s really an easy and light card game to pick up. The whole game only takes about ten minutes, so it’s great to play between other tasks — just grab a quick game or two on a lunch break, then get back to whatever you’re working on. It’s a great card game to play with your friend between conversation. There are a lot of lovely design choices when it comes to these cards. Each item is easy to recognize by its category, even without viewing the graphic on the back. The colors show the matching sets, as do the background patterns and the look of each item as well. Thronestorm’s developers wanted to make it so that the cards didn’t have stats or symbols on them and instead focus on the artwork, which works so well. I very much enjoy Thronestorm — from the artwork to the subtle strategic moves. It’s is very complex if you play against people who think their moves through. Light card games are becoming a favorite of mine due to how light they are physically and how easy they are to bring around to a friend’s house and just play. Thronestorm fits well into this stack — it’s a game I will probably play when someone comes to visit next. The games that come out of this group of developers so far have been very different in variety, gameplay and style — and I look forward to seeing what they create next. 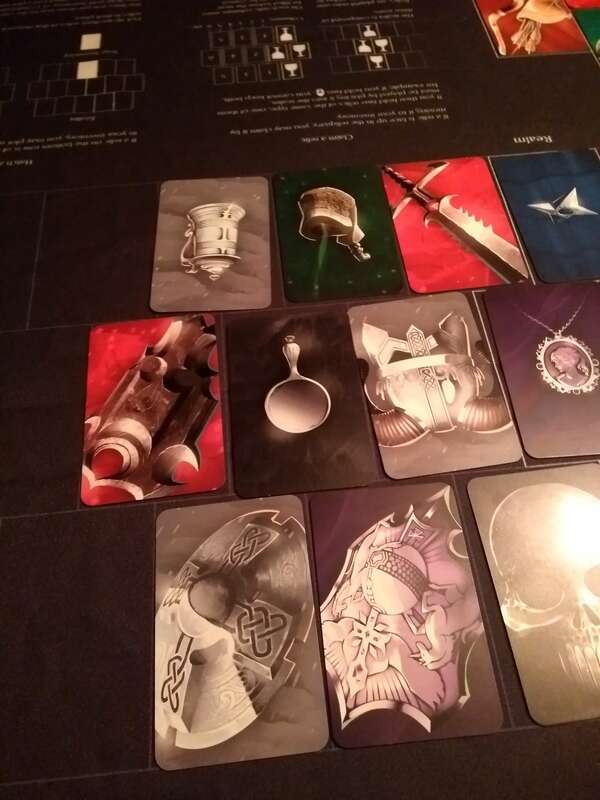 A copy of Thronestorm was provided for review purposes. You can purchase a copy of Thronestorm on Amazon. You can find more games on Original Content London’s website.